It’s January and that can only mean one thing for theatres nationwide: time for all the campy action and demon possession movies to come out and play. However, with “Haywire,” I had read online that it was much better than it looked and, considering the supporting cast (Michael Douglas, Channing Tatum, Antonio Banderas, Bill Paxton, Ewan McGregor and Michael Fassbender), I was intrigued. The film stars retired MMA fighter Gina Carano in her first big movie (she’s had cameos in a straight-to-DVD movie or two). She plays ex-Marine and current gun for hire Mallory Kane, a skilled fighter and expert field operative. After taking a mission in Ireland, she finds herself set up for murder and hunted by her employer (Ewan McGregor). Of course, this leads to Mallory tracking everyone down and finding out how many vases she can break over each man’s head, etc.It’s not that original of a concept. Given that we’ve all seen the “scorned spy out for revenge” story countless times, what does “Haywire” bring to the table that makes it different? In a word: style. Director Steven Soderbergh (the “Ocean’s Eleven” series) is shooting for a very B-movie vibe to his film. The music is low key. Scenes that are heavy with dialogue take longer than they feel necessary. The film is a thriller for sure, but it’s not in any hurry to get to the thrills. While Carano may not be the best actress, it’s hard to criticize her too much in a genre defined by the likes of Arnold Schwarzenegger. That being said, acting lessons should be sought after. Her delivery is flat and I can’t say I would have been upset in the least bit if Michael Fassbender had killed her off 40 minutes in (which is also a script problem). But with bad actors in action films, there is usually a pay-off. For Gina Carano, it is her MMA-infused fighting style. 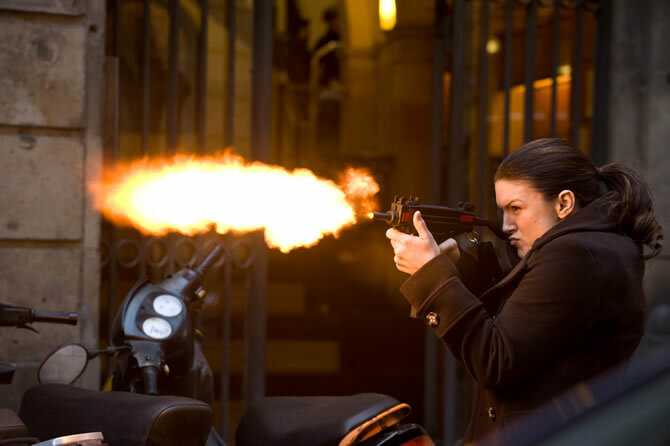 Soderbergh sets action scenes against a blank wall or some other still environment and lets Carano go to work. The contrast pays off nicely in several scenes and these are arguably the best stuff the movie has to offer. To save Carano from looking too bad, the producers hired a slew of veteran actors (listed above) to carry scenes which featured more than a few lines of dialogue. Of these actors, Douglas and Fassbender probably do the best with their material. Some interesting camera work, good fight scenes and talented supporting cast try to make this film better than your average January disappointment, but I wouldn’t suggest “Haywire” to anyone looking for more than just a B-movie action flick. Hey, in a few months it could make a good rental.